We are a major Importer and Supplier of Nyco Wollastonite. Wollastonite is manufactured when excellent quality limestone is subjected to high temperature and pressure. 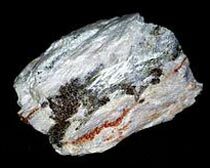 The Wollastonite is used for coating purpose in industries, marine and special purpose coating like roof coatings, etc. The Nyco Wollastonite offers high mechanical strength and excellent protection against corrosion. We offer such excellent quality coating material at very reasonable prices.